Dental implant surgery is performed to replace a tooth damaged beyond repair or that has been missing. Some people might think it's fine to live with a missing tooth, but the opening affects the overall bite and also gives the remaining teeth an area to migrate, with unpredictable results. A dental implant procedure begins with a comprehensive dental exam, which may include dental X-rays and models made of your teeth and mouth. A dental C.T. or 3D image may be needed in certain cases. Dr. Kashani, along with the possible involvement of an oral surgeon and periodontist, will create your treatment plan. Your dental care team will also tell you what to eat or drink before you have a dental implant procedure. If you have any type of oral infection, Dr. Kashani will prescribe antibiotics to clear it up before the dental implant surgery begins and you may need to take antibiotics after surgery as well. If your jawbone isn't thick or wide enough, you may need bone grafted to the area to allow for the implant to be placed. The bone is usually cadaver, sterilized freeze-dried bone, and is very safe. Some patients may need a sinus lift in the upper posterior arch. This will allow room for the implant to be placed if the sinus has dropped. This can also alleviate sinus problems as it pushes the sinus up and debris out! For implant surgery you will need local anesthesia and/or sedation. If you get sedation you will need someone to take you home after your outpatient surgery. Once you are numb there is no pain involved and it is a pretty routine procedure. A dental implant procedure begins with having your bad tooth removed (unless you're missing a tooth). The Doctor will then drill holes into the jawbone where a small titanium post will be placed. You won't feel any pain because you will be numb. The post acts as your new "root". You will then go through a healing period where the jawbone fuses with the metal post. This can range from 3-6 months depending on the area of placement. You can use a temporary "flipper" to fill the area of the missing tooth, especially if it is in an esthetic zone. Sometimes a temporary crown can be placed right away onto the implant. Some patients may return for another step called the "uncovery" of the implant. If the implant was buried under the gums, it will be exposed at this appointment. A small amount of local anesthesia is needed for this procedure. The healing time for this can be anywhere from 2 weeks to one month. Finally, you'll have an impression made to create your realistic-looking artificial tooth and the final crown is cemented in another appointment! 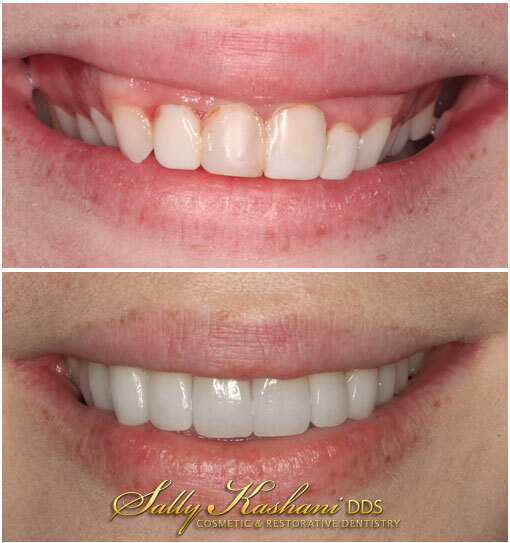 If you’re thinking about getting a dental implant, please call Dr. Sally Kashani at (818) 508–7272 to make an appointment to discuss this effective treatment with an experienced dentist.